Remember those Traditional Bar Phones with Buttons? Well, if you would now look around chances are you won’t find many People using them because of the Fact that how much we have developed in Tech Department over the last few years. But What’s that one thing that those Bar Phones offered us that these Modern Day Smartphones are not able to? Well, if you would ask anyone including us, chances are they would say Battery Life, No? Remember those days when we were able to use our Phones for more than 2 days on a single Charge easily? Well, if we would compare them with these Modern Day Smartphones in terms of Battery Backup, then we would be able to see a Huge Difference. Well, this is due to Larger Displays, More Apps, More Functionality, Android Operating System and much more. But still, you can do some things to get the Most out of your Android Smartphone’s battery. 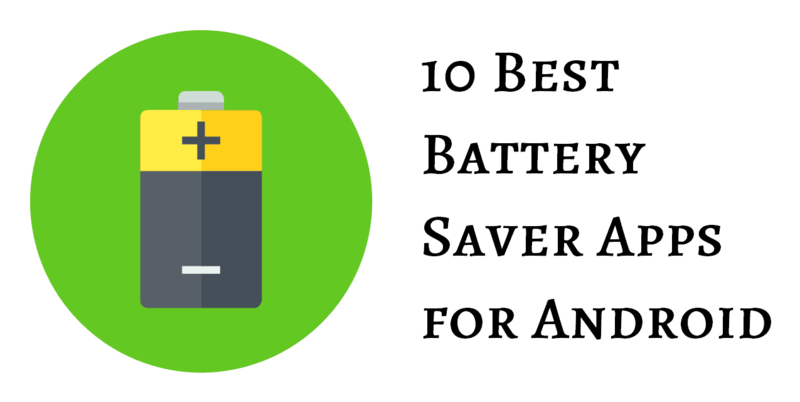 So here we are with our List of 10 Best Battery Saver Apps for Android. So without wasting any more time, let us start our List of 10 Best Battery Saver Apps for Android. Greenify is undoubtedly one of the Most Powerful and Popular Battery Saver App for Android Devices. The Application is available for free on the Google Play Store to download. The App can be used to take out the Culprits which are eating memory and your Android Smartphone’s battery in the Background, you can then Uninstall the Application and even can Hibernate them to get the most out of your Android Smartphone’s Battery. You can get even better Results if your Android Device is Rooted, as you’ll be able to do more in order to get the Most out of your Android Device’s Battery. Greenify also helps in Memory Management, you can take a look at the Apps which are taking more memory, can kill them and have a lag free Experience on your Android Smartphone. Greenify is overall a Great Application for your Smartphone that can help you in many ways. Download Greenify for free by clicking on the button below. With Over 63,000 Users, Mobile Booster & Cleaner comes in at Number 2 on our list of 10 Best Battery Saver Apps for Android. Mobile Booster & Cleaner is developed by McAfee LLC with Intel Security and it helps in boosting the Smartphone’s Performance by disabling the background apps and tasks, freeing up more memory and storage Space. There are a lot of options in the Settings to play with. You can easily get some free space on your Android Device with the help of the Cleaner inside the App. The App helps in smooth Performance for your Android Device by killing Unnecessary Background tasks and Apps, which in turn helps in saving battery. Thus, the user is able to get better battery backup with the help of this App. The App provides on-screen data usage which shows the Internet Data Usage Stats. The App is available on the Google Play Store to download for free. Battery Doctor ( Power Saver) has a rating of 4.5 out of 5 and has over 8,163, 000 users as of now which makes it Number 3 on our list of 10 Best Battery Saver Apps for Android. The App supports over 28 languages, and chances are that this App supports your Regional Language as well. The App does a lot, with only one tap the App starts doing its Optimizations and kills the Apps consuming more battery. The Application allows you to check and take a look at the Apps which are consuming much battery so that you can remove the Apps which you don’t use very often to get more juice out of your Battery. Other features include the Brightness Control, Stopping of the Apps Processes when the Screen is off which is quite useful. Battery Doctor is also available for free on the Google Play Store, you can download the App by clicking the button below. You might have heard of Avast before, it is one of the Most Popular Free Antivirus for both PC and Android. But surprisingly there are a lot of People who don’t know that they have a Battery Saver too, the app is updated after hearing a feedback of over 230000 Users from around the World. The App has a rating of 4.4 out of 5 on the Google Play Store. The App has a nice and elegant User Interface which makes it even more attractive, the app is easy to operate. There is a lot that this App can do to save your Android Smartphone’s battery like displaying the remaining battery life and prompts you to take mandatory action which helps in saving your Android Device’s battery. There are a lot of pre-defined Profiles to choose from, you can also create your own profile according to your Needs. The App is available for free on the Google Play Store, download this App by clicking the button below. One of the Most Popular Android App for saving your Smartphone’s Battery, DU Battery Saver is trusted by over 400 million users and has around 12,685,536 Currently. The App has gained a lot of Popularity in the Battery Saving Applications for Android. The App automatically detects the battery draining apps and tasks and stops them so that you can get some extra minutes of Usage. There is an advanced section within the App in case you want even more Battery Life on your Android Device. The App does a very well job even in cooling your Smartphone down, what this does is shuts down the Application consuming more CPU usage. The App does a very good job overall to save some amount of battery on your Android Device. This App is also available for free to download on the Google Play Store. You can also download the App by clicking the button below. Power Clean (Optimize Cleaner) is a Professional Battery Optimization App for Android which has over 100 Million Users Worldwide, the App has a rating of 4.6 out of 5 which is again a very good score. The Power Clean (Optimize Cleaner) app helps in the Performance of the Android Device with Battery Backup. The App automatically detects battery draining apps so you can disable them to get the Most out of your Android Smartphone’s Battery. The App has a very User-Friendly and Clean Interface which makes it appealing to the User, the app does a decent job when it comes to saving the Battery on any Android Device. Power Clean (Optimize Cleaner) too, like every other App on our List of Top 10 Best Battery Saver Apps for Android Device is available for free on the Google Play Store, you can download the Power Clean App by clicking the button below. Battery Saver 2017 is another great Android App released in the Year 2017, that’s the reason it says 2017 in the title itself. This App got listed on some of the Most Popular Websites for the Best App for Battery Saving This App. lets you control energy-consuming apps easily on your Android Device. Whenever your Smartphone gets very low on Charge, this app automatically turns the Power Mode on which gives you more Screen on time. The App has a lot of Controls including tasks management, Screen Brightness, and many other Controls which helps in saving the Battery. The App is available for free on the Google Play Store, you can also download the App from the button below. Battery HD is another free Android App with a Beautiful User-Interface, the app does a decent job when it comes to saving battery. One of the best features of this Battery HD App is that you can calibrate this app. The app has a widget also that you can place on your Home Screen to get some functionality directly from the Home Screen of your Android Device. The App has a rating of 4.6 out of 5 on the Google Play Store, there are more than 490,000 Users Worldwide. You can take a look at the Battery Usage charts from the app itself. The App comes in handy when you like to get some extra juice out of your Battery. Battery HD is also available for free on the Google Play Store to download, you can also download the App by clicking the button below. With Over 293.000 users, 360 Battery Plus-Battery Saver comes at Number 9 on our List of 10 Best Battery Saver Apps for Android, the app works in the background to track the Apps which are drinking the Juice from the Battery, the App shows the Graph that shows the amount of Battery Consumed by the Apps, the app also tracks the autostart apps and restricts them so that you can get the most out of your Android Device’s Battery. The App has a rating of 4.5 stars out of 5 which is quite impressive. There are a lot of settings to play around with. 360 Battery Plus-Battery Saver is also available for free on the Google Play Store, you can also download the App from the button below. The last and final app on our list is Accu battery, a free Android App which has an awesome User-Interface. If you are a fan of Material Design that you should definitely check this app out at least once. The App monitors your ANdroid Device’s Battery Health and gives you Report on the Same. The App also restricts unnecessary background Apps and Tasks so that you can get even better Screen On Time. Accu battery has over 16,000 Users and has a rating of 4.6 out of 5. Overall, Accu battery does a decent job in terms of saving your Android Device Battery. Accu Battery is also available for free on the Google Play Store, you can also download the App from the button below. So that’s it that was our list of 10 Best Battery Saver Apps for Android. Did we miss any? Well, let us know your recommendations in the Comments down below.